Stephen J. Kerrigan oversees everything from the security arrangements to goodie bags. CHARLOTTE, N. C. - For a few moments, Stephen J. Kerrigan set aside questions about convention fund-raising problems and angry unions. He ignored the Occupy Wall Street demonstrators marching through downtown Charlotte. He tuned out headlines about North Carolina’s ban on gay marriage. Instead, the chief executive of the Democratic National Convention leaned over a conference table in his office and carefully scrutinized three bottles of barbecue sauce. “Well done,’’ Kerrigan told a marketing aide who nervously awaited his approval. “This was not easy.’’ Even the choice of official convention grilling condiment carries political peril in a state where BBQ is taken very seriously, indeed. To be safe, the convention sampler on sale will include all three local styles: ketchup, vinegar, mustard. With oven mitt and apron emblazoned with the convention logo, the package will sell for $55.80. It was another of the thousands of details great and small that Kerrigan must attend to before the digital clock on his wall counts down to zero - signaling the moment on Sept. 6 when President Obama accepts the Democrats’ renomination for president in Bank of America Stadium. 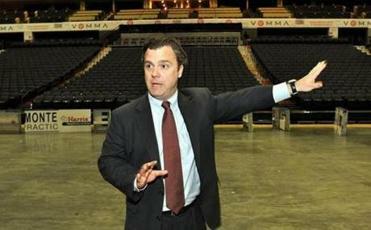 Stephen J. Kerrigan, the chief executive of the Democratic National Convention, checked out Time Warner Cable Arena. Kerrigan - a veteran Massachusetts political operative and former longtime aide to the late Senator Edward M. Kennedy - is tackling the biggest challenge of his career. He led the Democrats’ search for a convention site that could have an effect on the 2012 election, a search that settled on North Carolina. Obama won the state by 14,000 votes in 2008; the thinking was that a convention there could generate enough excitement to produce a repeat. The veteran Massachusetts political operative is currently the chief executive of the Democratic National Convention. But now, even as he oversees everything from security arrangements to stocking delegate goodie bags, Kerrigan is suffering the headaches of selecting a southern beachhead. Liberals and gay-rights activists are upset that North Carolina voted this month to define marriage as solely between a man and woman. And Obama’s subsequent support of gay marriage could make the state harder to win in November. Unions, meanwhile, are angered that Democrats chose a right-to-work state, and some are refusing to help pay for the event. Occupy Wall Streeters are demonstrating against one of Charlotte’s largest employers and a major bailout recipient, Bank of America, which owns naming rights for the stadium where Obama will be anointed. The protests are just a preview of the demonstrations expected during the convention. Money is another problem. 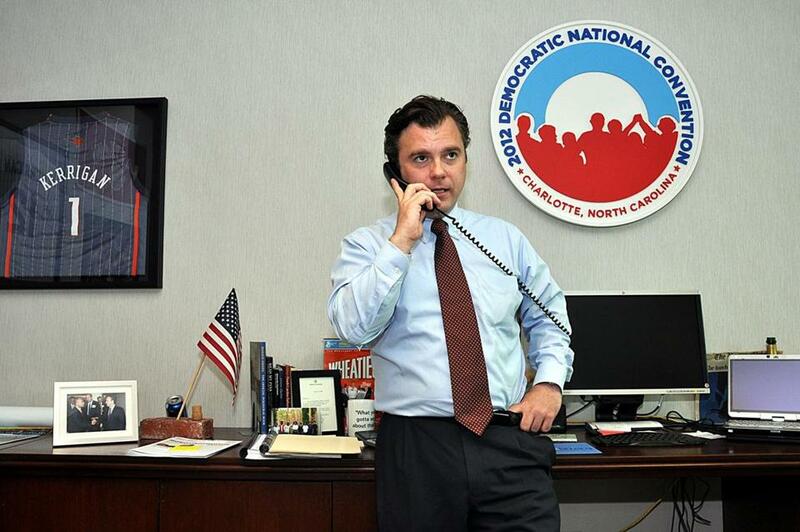 The Democratic National Convention Committee and the Charlotte in 2012 Host Committee - a parallel operation that helps put on the convention - are wrestling with Democrats’ decision to break with tradition and shun direct corporation contributions to pay for the convention. News accounts recently have said the Host Committee was still about $20 million short of its goal of $36 million - cash that is needed for things like renting the convention arena and football stadium, creating the glitzy stage sets, transportation for delegates, establishing a fully wired media filing center, and throwing lavish parties. Kerrigan insists Democrats are on track to raise all the money, including through smaller checks from e-mail and social media networks. But just in case, the Host Committee has a $10 million line of credit with Duke Energy, one of Charlotte’s largest corporations, to plug any holes by convention time. Whether the convention will win a public relations victory by banning corporate financing remains unclear. The host committee is still soliciting contributions from individuals, including wealthy chief executives, of up to $100,000 each. Unions and foundations can kick in unlimited sums. Corporations are permitted to donate goods or services, so-called in-kind donations. Registered lobbyists may not contribute themselves, but they may bundle contributions from their clients and others seeking to gain influence with the party. The convention will have tiered levels of access, with major supporters securing the exclusive use of luxury sky boxes at the Time Warner Cable Arena and the Bank of America Stadium, home of the Carolina Panthers. The Wall Street Journal reported last week that large corporations including Bank of America, Wells Fargo, and Duke Energy are stocking an entirely separate fund with more than $10 million to support various parties and activities that will boost Charlotte outside the convention hall. Kerrigan asserted that Democrats will have the moral high ground - even while accepting large amounts of special-interest support. He touts the Democrats’ plan for a huge event at Charlotte Motor Speedway on the first day of the convention - Labor Day - that will be free for the public. Kerrigan, 40, who once studied to become a Xaverian monk before choosing politics, grew up in Lancaster, Mass., the son of an elementary school secretary and a retired electric company lineman. He has a quick wit and frequently leaves his staff laughing. But associates say he is a firm leader, prone, for instance, to summoning staffers by barking out their last names. He contends it is better to endure some controversy and some political headaches while seeking to expand the electoral map rather than to play it safe. “If we only went to a state or a city that agreed with us on every issue, we would be limited in where we could go,’’ Kerrigan said last week, the day after North Carolina voters decided by 61 to 39 percent to ban gay marriage. Kerrigan, who is openly gay, also sought to strike a conciliatory note over the vote. “It is not reflective of the North Carolina that I have come to know and love,’’ he said. Kennedy’s widow, Victoria Reggie Kennedy, called Kerrigan to discuss the marriage ban. With a reporter present in his office, he told her it was “personally disappointing.’’ A few hours later, Obama became the first US president to declare his support for gay marriage. Kerrigan worked for more than a decade in Washington and Massachusetts as a Kennedy intern, scheduler, constituent services director, and political director. His office in Charlotte is adorned with Kennedy souvenirs, including a poster from Kennedy’s 1994 Senate seat defense against Republican Mitt Romney. “I owe him basically everything,’’ said Kerrigan. He remained close with the senator and the family well after he had left the senator’s office in 2003. In 2009, he handled arrangements for Kennedy’s funeral Mass in Boston. Kerrigan worked as chief of staff to Massachusetts Attorney General Thomas F. Reilly from 2003 to 2007. That job was punctuated by a stint as chief of staff of Boston 2004 Inc., the host committee for the Democratic National Convention. Kerrigan’s own attempt to win a state office ended poorly. After serving as a Lancaster selectman, he ran in 2008 for a Massachusetts House seat against incumbent Representative Harold P. Naughton and got trounced, 72 to 28 percent. After the defeat, he signed on to the Obama campaign. Once Obama secured his victory, Kerrigan was back home drinking a beer with his father at the Elks lodge, when a call came summoning him to Washington. The Obama team wanted him to help run Obama’s inauguration as chief of staff.